The latest issue of the Automotive News Europe goes live on Monday, Sept. 7. 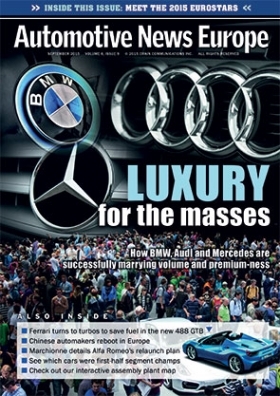 This month's edition examines how Audi, BMW and Mercedes-Benz have been able to boost their combined market share in Europe without hurting the profits or image.Monday, August 3. Audi sales chief Luca De Meo tells us how the automaker is changing its "center of gravity." BMW brand sales boss Ian Robertson discusses what BMW did to address "a totally different customer" with its 1 series and 2 series, X1, and the Mini family. Mercedes sales and marketing head Ola Kaellenius shares his strategy for maintaining premium-ness while significantly boosting the brand's lineup of high-volume compacts. Fiat Chrysler Automobiles wants to challenge the German premium trio with its latest relaunch of the ailing Alfa Romeo brand. FCA CEO Sergio Marchionne explains in an interview why he feels the new Giulia is “better than a German car.” In the same interview he tells us that he has the power to stop the company’s 5 billion euro investment in the brand. Hyundai Europe’s new chief operating officer, Thomas Schmid, expects record sales from the Korean automaker in the region this year, but he says Hyundai will not grow as quickly as it did in the past. Hyundai’s new focus for Europe is on boosting profits by transforming itself into an emotional choice capable of charging higher starting prices. Chinese automakers hope to revive their European sales ambitions by targeting the region’s booming SUV market. The Asian automakers’ first assault on Europe, which started 10 years ago at the Frankfurt auto show, delivered uninspiring passenger cars that failed badly. We look at what will make this latest attempt different. PSA/Peugeot-Citroen wants its connectivity solutions to strengthen customer loyalty by being simple and seamless. The French automaker’s connected car boss, Brigitte Courtehoux, explains why PSA picked its upscale DS brand to debut the company’s newest technologies. One clear trend emerged from Europe’s first-half vehicle sales: Torrid demand for SUVs and crossovers is putting increased pressure on minivans. Overall sales of people movers decreased 13 percent in the first half to 582,000 units from 657,000 in the same period last year. See which segments were the big winners in Automotive News Europe’s twice-yearly analysis of Europe’s 24 key market analysis. On the product side, we look at how Ferrari is trying to convince its faithful buyers of its V-8 coupes that turbocharged engines can top normally aspirated powerplants. The first example is the turbocharged 488 GTB, which is more powerful but more economical than its predecessor. On the supplier side, the auto industry’s adoption of driver-assistance systems is looking like a gold rush. See which suppliers are poised to gain from a forecast doubling of the global market for the technology. The section also provides insight into which suppliers have won business in the new Volvo XC90. Carlos Tavares has revived PSA/Peugeot-Citroen, which is making money again after five years of massive losses. Skoda CEO Winfried Vahland has guided the Czech automaker to new sales and earnings records. Nissan Europe Chairman Paul Willcox has put his automaker in position to pass Toyota as Europe’s top-selling Asian brand. Mercedes design boss Gorden Wagener is responsible for the stylish looks of models such as the CLA, GLA, A class and S class, all of which are contributing to the German automaker’s huge success in showrooms around the world. The other 10 Eurostars, who were chosen by the editors of Automotive News Europe, have achieved equally impressive results.